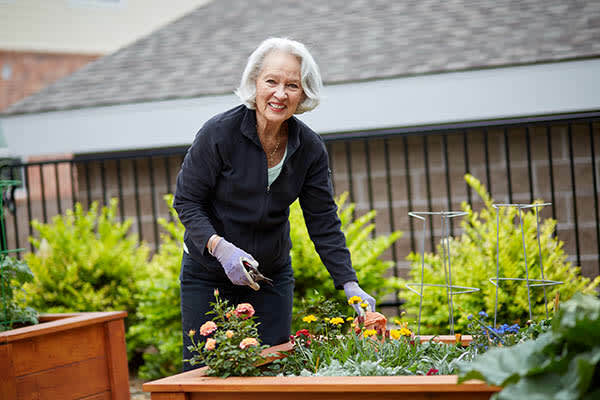 Life Plan Communities, formerly known as continuing care retirement communities, offer a variety of services within one community: residential living, assisted living, memory support and long-term nursing care. Who owns and manages Holly Creek? Holly Creek is owned and managed by Christian Living Communities (CLC), a local non-profit 501(c)3 organization. Located in Denver, CLC is a faith-based, not-for-profit organization that has been in operation since 1972. CLC’s board of directors are unpaid volunteers who partner with our executive team to carry out the mission of Christian Living Communities (CLC). Christian Living Communities is a not-for-profit organization representing a family of companies organized to enrich the quality and dignity of life for older adults and their families. Click here to learn more about Christian Living Communities. Click here to see the CLC FAQ page. What is the value of being a not-for-profit? Our number one priority is providing you or your loved one with exceptional services and care, not meeting shareholder margins. Choice, respect, growth and empowerment are what you’ll find here in maintaining your lifestyle or exploring new opportunities. Who is qualified to become a Holly Creek resident? You or your spouse must be at least 62 years of age, financially able to meet the terms of the application and pass our health review. Do I own or lease your cottages? Apartment suites? Holly Creek owns and maintains these properties. Do you provide moving support and services? We regularly host a free moving program to provide tips and advice on how to plan, organize and downsize prior to moving. We also partner with Moving Station to provide real estate service support if needed. I’m not in need of health care assistance. Why should I move to Holly Creek now? The Holly Creek lifestyle is based on the Masterpiece Living philosophy, which is centered on helping you live a longer and healthier life and aging successfully. If you wait until your health declines considerably, you may not qualify for the Life Care contract. Living at Holly Creek ensures your plan for your future, you are in control bringing you and your family peace of mind. What are your dining options? Holly Creek offers a very unique and flexible dining program. Included in your monthly fee is a meal credit that you can use any day, any way you like at our three restaurants. Guests are always welcome. How often do your restaurants’ menus change? Can you honor special dining requests? The menus at our three restaurants change daily, weekly and monthly. As much as possible, we source food locally and all our meals are prepared fresh as ordered. Special requests are not a problem. Can I bring my domestic pet(s)? Yes, ask us about our guidelines. Can I redecorate or remodel my apartment/cottage? Absolutely, this is your home. However, all customizations must be approved in advance by our Maintenance Director and Executive Director. I can no longer drive. Is onsite transportation available? We offer daily scheduled transportation for appointments, shopping and entertainment five days a week and church transportation on Sundays. How often can friends and family visit? I belong to an organization (Red Hat Society, PEO, VFW, etc.) Can I host meetings here? Definitely, there are many places at Holly Creek to host meetings. Although we cannot guarantee that we can host meetings for non-residents, we do our best to try to accommodate. Is there underground parking at Holly Creek? Yes, underground parking is available with a fully refundable fee. Surface parking is complimentary. Can I use/reserve specific space (restaurant/library/theater, etc.) for a special event or family gathering? Yes, room reservations and refreshments can be arranged with our Dining Services Director. What types of services/support do the concierges provide? Is there an extra fee for this service? Our concierges coordinate health and safety support, appointments, reservations, dry cleaning services, packaging/shipping, and many other tasks. The cost of this is covered in your monthly fee. Can I suggest activities, outings or form my own club? Definitely. This is your home and we are here to help you enrich your current lifestyle. Can friends or family stay the night? Yes, your guests can stay in your home for up to two consecutive weeks. What hobbies can I continue if I move here? Holly Creek supports a variety of hobbies and activities. We have an onsite woodworking center, arts and crafts studio, theatre, and a variety of clubs. Gardeners are welcome to plant patio pots or assist with our community garden. If you’ve never had time for a special interest or hobby we can also help you find one, make a suggestion, we’ll make it happen. Are we allowed to smoke on campus or in our apartments? No. Holly Creek is smoke-free. My children think I need to move into assisted living, but I don’t. Who decides what type of support I need? Our goal is to preserve your independence and help you age where you currently live. To decide future care, we consult with you, your physician and your family to determine your health condition and care requirements.